Picard finds love with Lt. Commander Nella Daron, the ships's new Stellar Sciences department head. When the Enterprise is sent to study the fire-storms on Bersalis Three, Picard is torn between his love for the woman and his duty when he is forced to send her on a dangerous mission. Picard's old archaeology professor tries to tempt the captain into leaving his ship to help him finish up his work in a profound discovery, without success. But when the professor is killed, Picard is drawn into a mystery that also attracts the Klingons, the Romulans and the Cardassins! 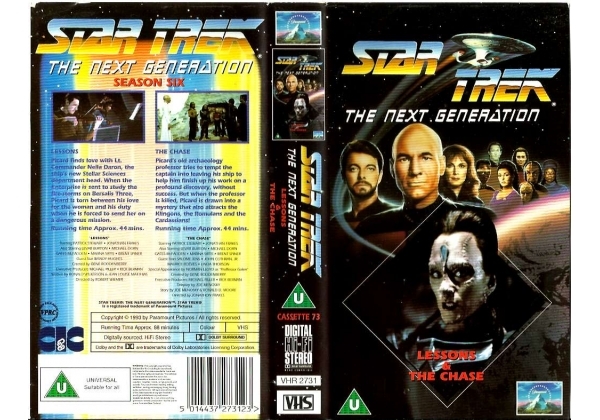 Or find "Star Trek: The Next Generation Cassette 73 - Lessions/The Chase" on VHS and DVD / BluRay at Amazon.